Nikhil Goyal is a journalist who has appeared on MSNBC and FOX and has written for The New York Times, MSNBC, The Nation, and other publications. Goyal has also had speaking engagements with the Clinton Global Initiative University, Google, Stanford, the University of Cambridge, SXSW, and the LEGO Foundation, among others. In 2013, he was named to the Forbes 30 Under 30 list. He is also a recipient of the 2013 Freedom Flame Award. He lives in New York. 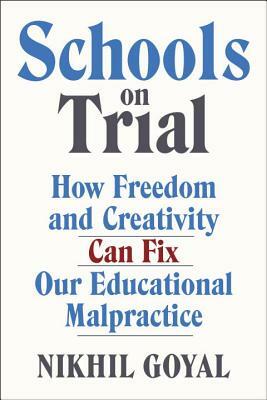 “Schools on Trial is a kaleidoscope of insights, a meteor shower of surprising enlightenments from the freshest, most just, vantage point on the institutional school scene—that of the student victim. Only three short years after graduation from Syosset High School on Long Island, Nikhil Goyal offers the reading public his penetrating reflections on the myriad insults he, his classmates, and millions of young Americans suffer at the hands of a badly designed social machine, and shows how its ‘malpractice’ can be fixed, almost without cost.